South Australians, who are living in high-risk areas, have one major advantage in preparing for their bushfire survival plans this year since summer and the threat of bushfires are looming. 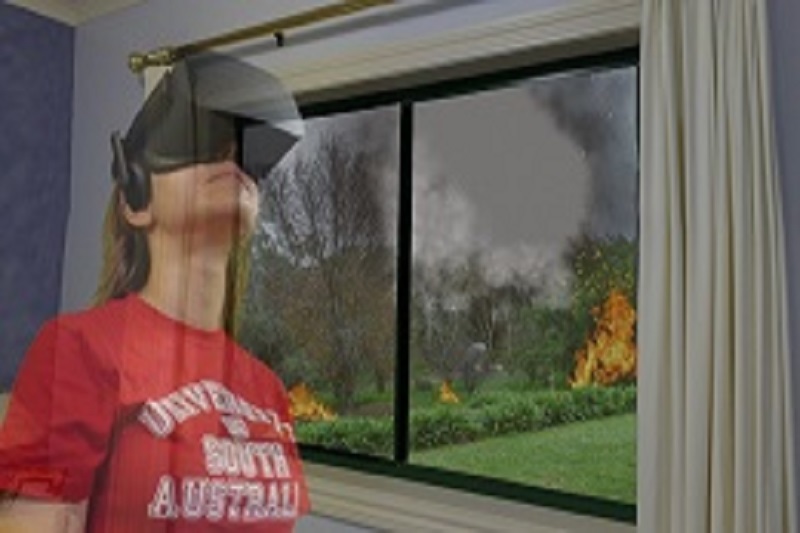 A joint project between the University of South Australia (UniSA) and the SA Country Fire Service (CFS) will give the residents in Tea Tree Gully, Belair, Mylor, Hahndorf and Gawler the chance to experience a computer-generated major bushfire through a virtual reality headset in November. This will be replicating real-life conditions, without the heat. According to a recent report, the headset gives people a searing experience of a major bushfire in the Adelaide Hills, without any actual danger. Officials hope the virtual reality scenario, which is an Australian first, will remind residents of the need to prepare bushfire survival plans ahead of a potentially lethal summer. The residents of Adelaide Hills will have a chance to try out the technology at a series of different locations in November. The virtual reality scenario replicates typical conditions experienced in a major fire, including strong, changeable winds fanning the flames. It puts users under pressure to decide whether to leave their homes early or stay and defend, which is in essence, what a bushfire survival plan is designed to do. The scenario is realistic but safe and underlines the importance of being prepared in the event of a major fire. Too often people think they will ‘leave early’ but then delay their departure, making evacuation more dangerous, or worse, not feasible. And while some people did stay and defend their properties during the 2015 fires, they told the University researchers that although they were physically prepared, the emotional experience of the fire was devastating. People often fail to recognise that the impacts of an experience with fire extend well beyond the incident itself. This virtual reality scenario allows people to experience what the consequences may be like if they do stay and defend. For some people, this might encourage them to rethink their plans. Virtual reality headsets are now being used by several emergency service groups to train their own staff, but involving the public is an Australian first. The scenario builds on research conducted as part of a joint UniSA and University of Adelaide Australian Research Council Grant. Researchers found people’s knowledge of fire, as a natural part of the Australian ecosystem, was relatively high. Same with their acceptance of prescribed burns. It was clear, however, that many people had not gotten around to making a bushfire survival plan. The 15-minute virtual reality scenario shows people the types of decisions that need to be made as a fire approaches and hopefully, encourages people to sit down and make a bushfire survival plan. The University researchers and the CFS will use the feedback from the virtual reality scenario to better understand how different people react in a fire situation. The information can then be tailored to what is most relevant to the people. Hopefully, different scenarios can be developed in the future, including one for the children and another one for people taking a holiday in fire-prone areas. Different ways are needed so that people can practice their bushfire survival plans without putting them at risk.